The addition of the red wine is totally optional, but it will add depth to the meat sauce. If you've got a spare (cough) glass of red, then add this in or you can buy little one glass bottles from the supermarket (pick something half decent). I add Parmesan to my white sauce, but any hard and salty sheep or goats milk cheese will do the trick. Taste as you add this to the sauce and check for salt levels - you can add but you can't take away! Some recipes suggest adding thick yogurt to the sauce for an authentic Greek taste - try it and see! Vegetables! I add courgettes to my moussaka because I like them and I use aubergine because it's 'traditional'. You can use whatever veg you want in your dish, but watch cooking times and make sure everything is properly cooked. The aubergine is typically salted and drained to remove some of the liquid and bitterness - there are arguments for and against this, but again, I've always done this and it's always worked for me. Because there is so much veg to grill, I put it all on a gas barbecue, however this is not possible for everyone, so you can use a frying pan or under the grill in your oven. The potatoes can be par boiled if you want to have them cut slightly thicker. I try to save cooking time by slicing them really thinly in the food processor. Lastly - when the white sauce is cooked it should have a slight wobble (like a good baked custard)! Start by topping, tailing and slicing the aubergine length ways. Place these in a colander over a bowl and salt liberally. 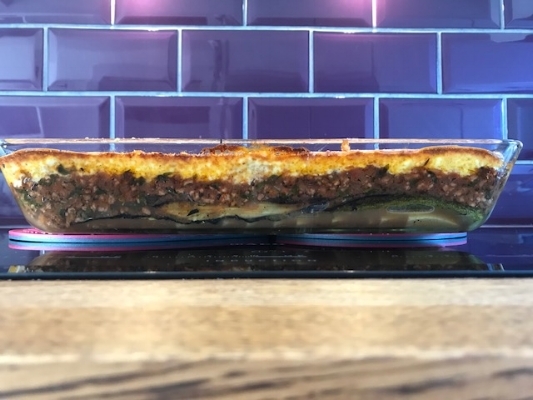 Cover with cling film, place a small plate on top of the aubergine (so it sits inside the bowl) and weigh down with something heavy (a couple of tins of beans will do). Refrigerate this for half an hour (see notes for alternatives). Top, tail and slice the courgettes in the same way and place in a large bowl. Once the aubergines have had their time in the fridge, add them to the courgettes and massage 4-5 tbsp of vegetable oil into the mix. Grill the aubergine and courgette until they are part cooked and preferably with a bit of browning. Set these aside. Slice the potatoes thinly (peel if desired) and rinse the slices under cold running water in a colander. Shake off any excess water and lay the slices over a clean tea towel. Roll the towel up like a sausage roll and set aside so they dry out a little. Chop the onion, garlic and thyme and sweat these in a little olive oil over a medium heat for 6-8 minutes (add a little salt to start the onions sweating). Add the sugar at this stage and continue to cook for a further 5 minutes until the mix caramelises slightly, stirring regularly to avoid burning. Add the minced meat and break this down with a spoon. Fry the mince for 6-8 minutes until the liquid evaporates and it starts to take on a brown colour. Add the cinnamon, oregano and tomato paste and stir through before pouring in the wine – scrape any bits off the bottom of the pan at this stage. Cook off the alcohol in the wine – 1-2 minutes. Add the chopped tomatoes and balsamic vinegar to the pan and bring to a boil before reducing to a simmer for 15-20 minutes. Once the liquid has reduced by half, remove from the heat and stir through the parsley. In a large saucepan, melt the butter over a medium heat and add the flour. Stir the flour into the butter with a whisk and cook this out for a few minutes. Heat your milk, either in another saucepan or in the microwave (very warm, but not scalding. Once the flour has cooked out, add the warmed milk in batches to the butter and flour mix whisking constantly until all the milk has been incorporated. Continue to cook for 2-3 more minutes before turning the heat off. Add the ¾ of the Parmesan to the sauce and stir until melted. Add the nutmeg and season to taste. Once the sauce has cooled a little more, add the egg yolks and whisk through – too hot and the eggs will curdle. In a large oblong oven dish, layer the sliced potatoes in the bottom. On top of this, layer the courgette followed by the aubergine (don’t be too fussy about this, but try to make sure that each portion gets a bit of both). Pour over the meat sauce and level this out with a spoon. Pour the white sauce over this and smooth the top with a spoon or spatula. Sprinkle the remaining cheese over the top of the dish and bake in the centre of the oven for 35-45 minutes, or until the top is golden and bubbling. I would recommend placing the dish on a baking tray in case it bubbles over in the oven. Add the thinly sliced onion to a bowl with a little salt and the juice of the lemon – allow this to sit for 10 minutes so the acid in the lemon takes some of the bite out of the onion (leave this stage out if you don’t plan on kissing anyone and like raw onion). Add the rest of the ingredients to the bowl and pour over the olive oil. Toss the salad gently (to avoid breaking the feta too much) and sprinkle with the dried oregano.